South Sudan's recent crisis has displaced 189,000 people, according to the United Nations refugees agency. The crisis began on Dec. 15 as fighting between ethnic Dinka and Nuer in the presidential guard (the president, who is Dinka, had earlier fired the vice president, who is Nuer). That fighting has quickly spread, with open rebellion in parts of the country and rising fears of all-out ethnic conflict between the country's two largest groups. 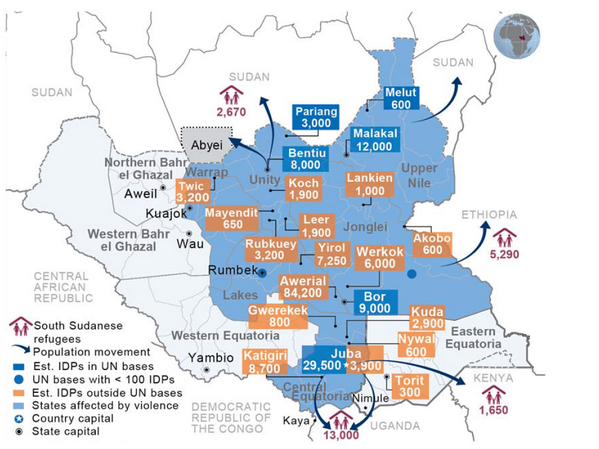 The United Nations has just released this map showing South Sudan's already-huge populations of people who have been displaced by the crisis, either into internal camps or out of the country entirely. An American family caring for 10 orphans in South Sudan were due to fly out of the country Friday night and leave the children they were fighting to take with them behind at a United Nations camp. Their family stayed with nearly 20,000 refugees at one UN camp before having to flee. Click to read the article and view brief video.